UPDATE: A south suburban mayor states that Foxx met privately with a group of south suburban mayors and black police chiefs in Markham more than two hours before the Rainbow PUSH press conference. There’s no word on why the meeting took place separately or why suburban chiefs did not appear for the media availability as promoted. Well, that didn’t go so well…or, maybe, it went perfectly. 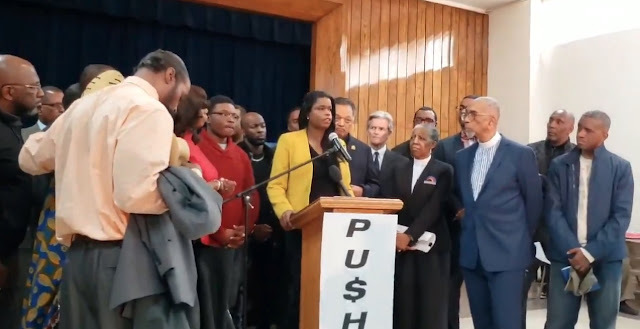 It was a counter-point to the Chicago Fraternal Order of Police press conference on Thursday in which dozens of suburban police chiefs expressed “no confidence” in Foxx’s management of the Cook County State’s Attorney’s Office with the Jussie Smollett case being one point of concern. There was a problem this morning though. Despite promises made to the media, no police chiefs showed up to support Foxx. Rev. Jesse Jackson Sr. organized the event but offered no explanation for the African American police chiefs' absences. Foxx’s comments, preceded by activist Jamal Green’s declaration of police to be the “Blue Klux Klan,” were brief. Foxx did not object to the Klan reference, and she repeatedly ignored inquiries from reporter Matt Finn about her support for the comment. Toward the end of her comments on Saturday, Foxx said that for two weeks since the Smollett case imploded, she's been asking, "What is this really about?" May we suggest that what it's really about is the obvious: The unusual, hurried, non-transparent resolution of a high-profile case and a series of conflicting answers that have followed from Foxx and her office. That's what it's really about. What was the basis for seeking an “emergency” hearing to resolve the Smollett case? Why were CPD Supt. Eddie Johnson and his department not given a heads up that charges were going to be dropped? Why did Foxx’s lead attorney on the case not object to the immediate sealing of the Smollett case records? Court researchers found that every other similar false report case handled by Foxx’s office since she took office resulted in a guilty plea. Why was Smollett's case the first to be handled differently? If deferred prosecution was the prosecutor’s goal, why did her office not follow state guidelines for such actions, requiring Smollett to maintain a clean record and perform a specific amount of community service over several months or more? Why did she continually say that she had “recused” herself from the case due to potential conflicts of interest, only to later reveal that she never actually recused herself? Why did she resurrect the "recusal" talking point even after admitting that it wasn't factual? Why, after she and her top lawyers insisted for days that the case was winnable and the police investigation solid, did Foxx write a newspaper op-ed in which she said the evidence was weak? We may never find out—at least not from Foxx herself. She has apparently decided to take shelter behind the “racism” shield rather than doing what elected officials in charge of prosecuting crimes with moral authority across the nation regularly do: Speak clearly and unambiguously about how their offices seek justice on behalf of victims and the state both in general and specific terms.